Endowment gifts are meaningful investments in the future of the North Carolina Symphony. The Symphony established its endowment in 1983 in order to build a strong and sustainable base of financial support that could function in perpetuity. Today, the endowment includes 58 endowed musicians’ chairs and more than 45 special-interest funds. Endowment growth has trended upward in recent years and is valued at more than $18 million. 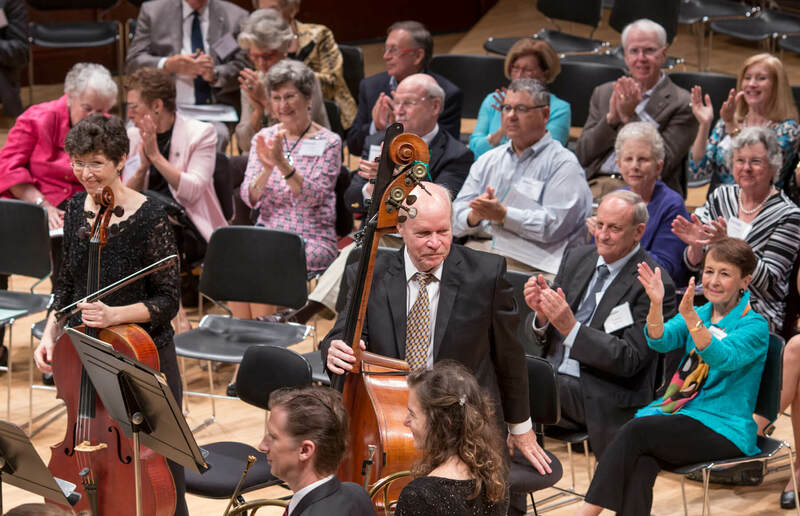 The North Carolina Symphony Foundation Board of Trustees oversees the endowment to ensure professional management and stewardship funds. The Foundation’s spending policy provides 4.5% of a 12-quarter trailing average to support Symphony operations, ranging from musician salaries to music education. Endowment gifts may be made during a donor’s lifetime (for example, with gifts of cash, securities, insurance policies, or real property) and beyond a donor’s lifetime through estate planning. Unrestricted gifts of all sizes made toward the general endowment fund help to reduce operating expenses, while restricted gifts are designated toward a specific purpose. Major endowment gifts may include public naming opportunities. To learn more and to determine the type of endowment gift that is right for you, please contact Rebecca Watkins, Director of Major Gifts and Planned Giving, rwatkins@ncsymphony.org or 919.789.5497. An endowment gift to the North Carolina Symphony ensures a brighter picture for our future. When you make a donation to our endowment, you give a gift with both immediate and long-term benefits. Endowment donations are invested. A portion of the annual income from the investment is used to address immediate needs at the Symphony. The remaining funds are reinvested to ensure indefinite support. The fund will exist in perpetuity within the Symphony Foundation’s endowment holdings. It would be unrestricted, in which case the annual draw from the fund would go to general support or to the greatest need or opportunity that year. A named undesignated endowed fund can be established with a gift or pledge of $100,000 or more. The fund will exist in perpetuity within the Symphony Foundation’s endowment holdings and can support a purpose that is important to you. For example, it can support the classical series, the music education program, guest artists, other performances or another program or purpose that is meaningful to you. It could also be unrestricted, in which case the annual draw from the named fund would go to general support or to the greatest need or opportunity that year. A named endowed fund can be established with a gift or pledge of $250,000 or more. The name you choose for the fund will be permanently associated with the chosen chair in all publications, vacancy position announcements, and more. This gift would fully support the musician’s base salary and can be established for a gift or pledge of $1,250,000. You may choose to support an existing fund or chair. While this option does not provide permanent naming, it does allow your gift of any amount to reside in the Symphony’s endowment fund and support a specific purpose with an annual draw of 4.5%. Celebrate occasions such as birthdays, anniversaries, and graduations with a tribute gift. These gifts allow you to honor someone special to you while supporting the Symphony’s mission of statewide service through music education and artistic excellence. With a one-time gift of $10,000, you may permanently endow two seats in Meymandi Concert Hall. We will acknowledge your seats on a personalized plaque with the wording of your choice. For more information on endowed gift opportunities and benefits, please contact Rebecca Watkins, Director of Major Gifts and Planned Giving, rwatkins@ncsymphony.org or 919.789.5497 .